First, discard any left over solution in the case. Clean the case with water; allow case to air dry when not used. To avoid mixing the lenses, always clean one lens at a time. To clean your lenses if it falls on the floor or counter etc., place one lens in the palm of your hand and fill with Simplus. Place your finger inside the lens and rub around your palm in circular motions for 30 seconds. That is how to clean the “outside” of the lens. To clean the “inside”, take the same finger and rub it along the “inside” of the lens. Move your finger along the inside of the lens for 30 seconds. Place the disinfected lens into case and completely cover it with Simplus Solution. Securely close the case and repeat steps 1-3 with your other lens. 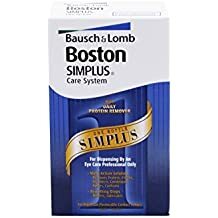 Rinse plunger with Boston Simplus solution after use or if dropped on the floor or counter. Let the plunger air dry and put back in case suction side up. Lubrication Drops are used before GVSS retainer lenses are placed in the eyes at night and before they are removed in the morning. Systane Ultra, made by Alcon, is another popular and easily obtained lubricating drop. It is available at most Target, Wal-Mart, drug stores and supermarkets. Refresh Optive, also made by Allergan, is a thicker drop that makes your lenses more comfortable when you put them in at night. Refresh Celluvisc, also made by Allergan, is the thickest drop made to make your retainer lenses very comfortable when you put them in at night, which come in preservative-free vials. 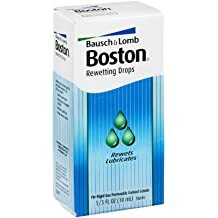 Boston Rewetting, made by Bausch & Lomb, enhances lens wet ability, which helps to make retainer lenses more comfortable during insertion and removal.